Enjoy the tranquil environment at Spavia while you restore harmony and balance and cultivate health and well being from within. Embrace this special time in your life with prenatal and post natal pampering designed to reduce discomfort, relieve stress and restore your body's tissues affected by pregnancy. The Maternity Massage will work out muscle tension, soothe joints, and improve your circulation from head to toe, helping relieve water retention and targeting fatigue, sciatic pain and muscle aches. Dad-to-be deserves some pre-baby pampering too! Spend the day together at Spavia so Dad can indulge in a relaxing massage. Bangz provides a unique and satisfying experience for each and every person. 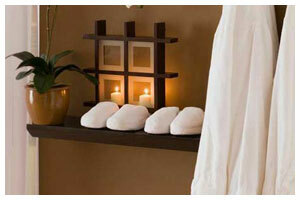 Enjoy some well deserved pampering with the Prenatal Bliss spa package. The leg treatment is particularly special and includes immersing your feet in a stimulating coriander-lime foot soak, followed by an invigorating exfoliation with a brown sugar scrub and the application of a nourishing masque. You finish with a leg and foot massage with hot stones, and a touch of polish if desired. Looking for an overnight babymoon getaway? New Jersey pregnancy massage package features subject to change. Please verify features directly with the facility at the time of booking.